Self-discipline can be difficult for anyone to apply, especially kids. However, this skill leads students to push themselves and be their best both on the Brazilian Jiu Jitsu mats and in school. For a young student to assess their available choices, recognize the best investment of their time, and then act seems almost counter intuitive to a generation so used to instant gratification. 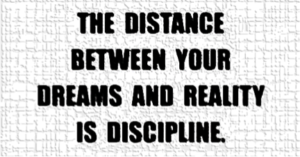 Creating awareness about the benefits of self-discipline and the composure it requires builds character. It stresses age-old values like the idea that hard work pays off. The student who goes home after training and puts in push-ups, pull-ups, and crunches will see the physical benefits over time, but more importantly, will build the mental fortitude to push themselves to achieve their goals. These are the types of lessons which transcend the BJJ mats and enter the school classrooms, and later, the workforce long after the sweat has dried. Victory, in all its forms, comes to those who understand that sacrifice is just another word for investment and in most cases, that investment requires the self-discipline we hope to instill.